I'm usually a pretty organized person. When I started this blog, I set a goal of posting once a week, and kept an organized list of ideas and projects, making sure to have some banked up if we were going on vacations, as to never miss a week. My system didn't fail until this spring, in the middle of this housing business. It does kind of feel like a business. I suddenly inherited the job of Head of Human Resources. A lot of my time is now spent researching various contractors, conducting interviews and hiring people. Resumes come in the form of bids, and the price range at times is shockingly wide (and perhaps sometimes wild). In the midst of learning more about various trades, I kind of lost track of time, despite looking at the calendar most of the day. We came back from this amazing place at the end of February, and if it wasn't for this unprecedented hot summer, I would tell you that it feels like early April. I just have no idea where the last few months have been. My best friend is having a baby pretty soon, and I barely managed to knit a blanket in time for her shower. That's just ridiculous. I know that I'll have plenty of time to make up for it once he's here, and that the end of summer probably isn't the best time for hand knits anyway, but still. I cannot wait to meet this little guy. So, last week, frantically, as we were breaking an all-time heat record, I was knitting a blanket. I couldn't bring myself to buy wool in this 90+ degree weather, and cotton seemed too heavy, so despite my prejudice against acrylic, I chose a synthetic yarn. I opted for Cascade Cherub Aran, a mix of nylon and acrylic. 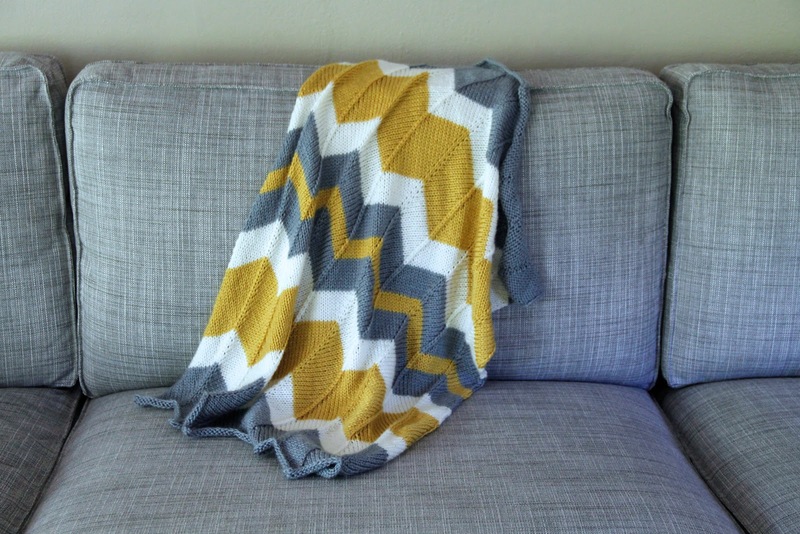 Let me tell you, despite the heat, the blanket was so soft on my lap as I was knitting, I almost considered telling my friend I ran out of time and would make it up to her, and keeping the blanket for myself. Not that I would ever do that. But that yarn is so incredibly soft. It came out of the wash looking great, and I will definitely use it again. 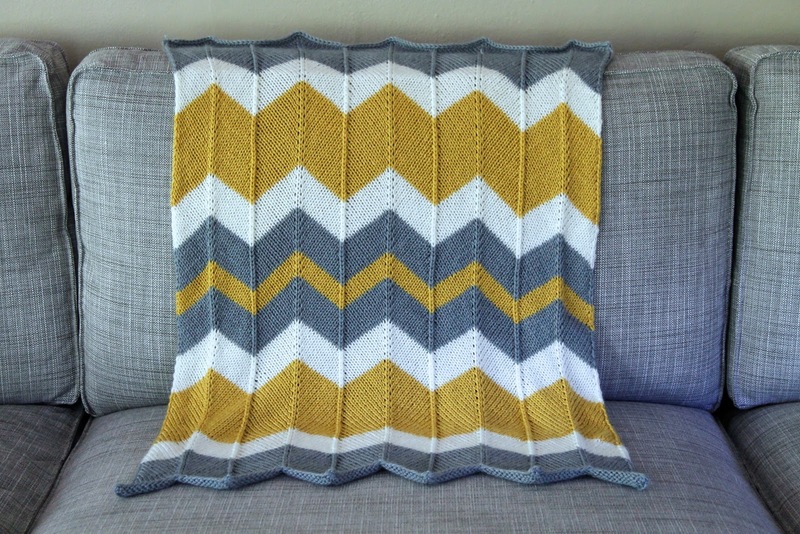 I love a chevron but had never knitted it, and was pretty excited, maybe a little intimidated, to try out this lovely Chevron Baby Blanket pattern by Espace tricot. Instead of using 5 colours, I decided on 3, and as I was knitting, had the impulse to change things up a little. 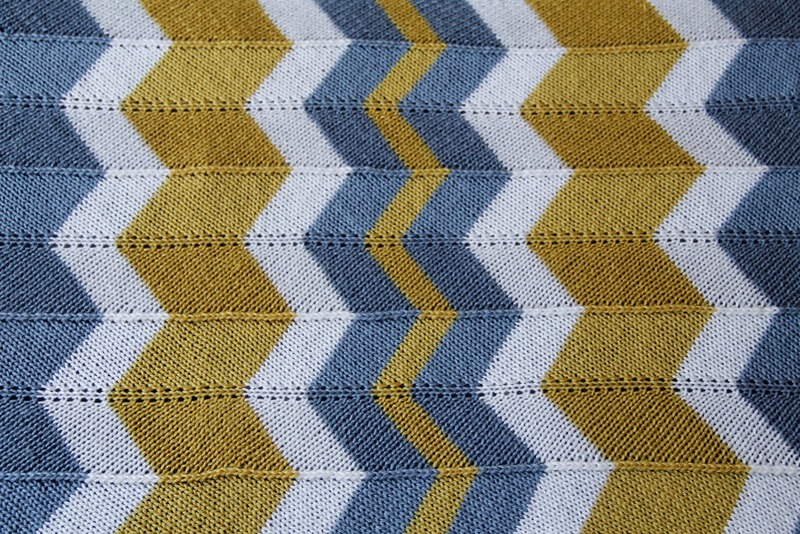 Instead of even stripes, I opted for varying the width. 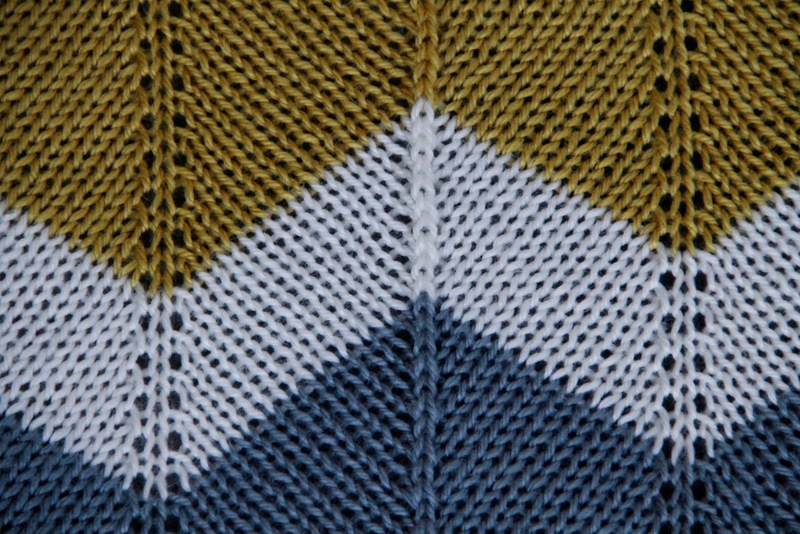 I knitted 20 rows for the thickest stripes, 10 for the smaller ones, and only 6 for the narrow yellow stripe in the middle. 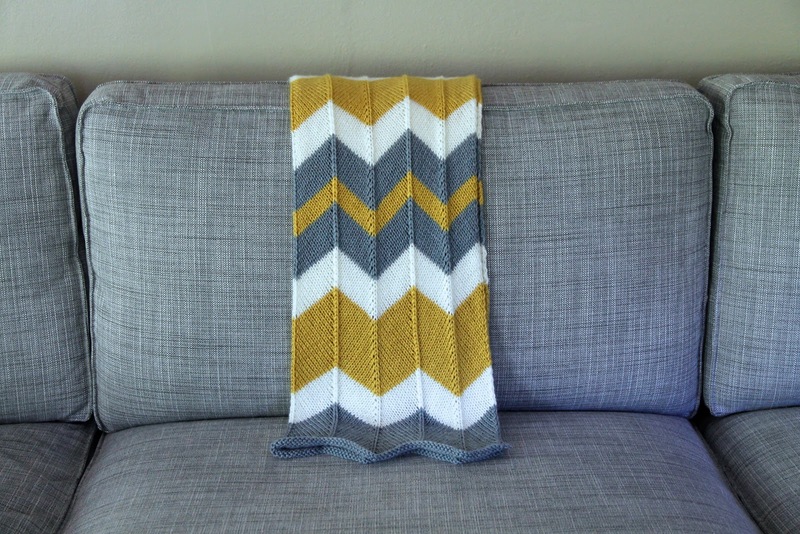 So many possible variations, I may just have to make more blankets. Turns out the pattern is easy to follow and looks great. 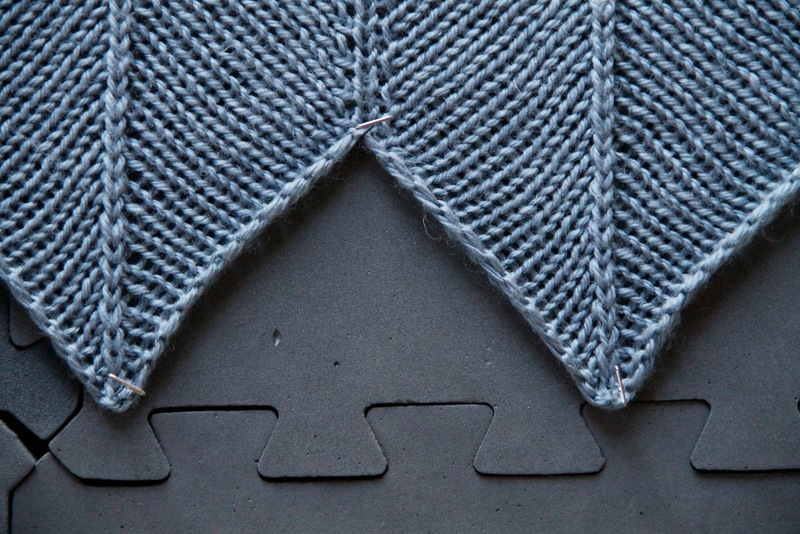 Blocking allows the ends to take the nice zigzag shape, and opens up the pattern. I hope that this little guy loves this blanket as much as I do! Thanks! You should come visit and we can knit together! Hi there! This looks beautiful! Can I ask what specific colours and how many skeins of each yarn did you use? Hi, thank you! I seem to have misplaced the labels, so I'm not sure about the colors (looking on the Cascade yarns website it looks like the particular yellow and gray may have been replaced) but I only used 1 skein of each, with enough yarn to spare to make a newborn hat in each color. I'll make sure to write down the specifics next time, thanks for stopping by!